In my opinion, formed after 50 years of trying to understand mass beachings, the biosonar system these orcas use to echonavigate was disabled by sinus barotrauma induced by disturbances in the surrounding water pressure generated above the epicenter of an extremely shallow earthquake off the west coast of South Island. The quake occurred at 8:54 pm local time on January 28th, 2014. The European-Mediterranean Seismology Group listed this event at 4.7 magnitude, focused only 2 kilometers below the ocean's surface . Other seismic stations reported this quake at 5+ mag. 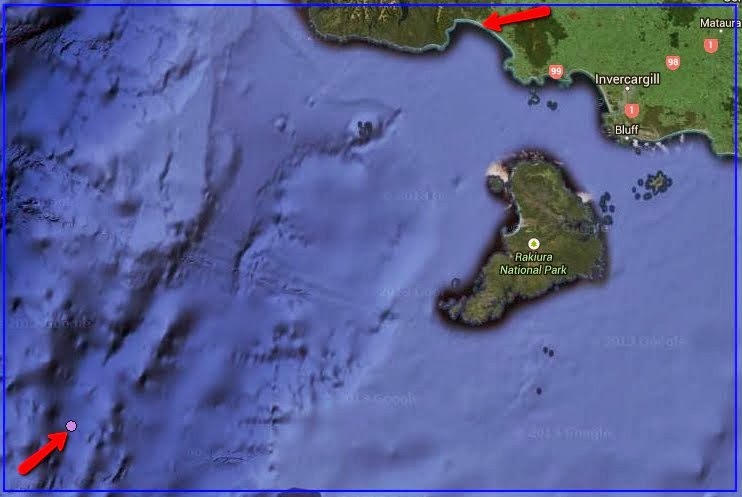 New Zealand GeoNet reported it as a strong earthquake at 5.4 magnitude; however, they listed the depth at 33 km, which is the standard default depth used by GeoNet for submarine earthquakes. As you can see at the bottom of GeoNet's page, most reporting stations indicated a depth of 5 kilometers. The depth of focus of undersea earthquake are difficult to pin down. An extremely shallow-focused (2-3 km below the ocean's surface) earthquake in water less than 500 meters deep would have generated a much stronger punch than an event 10 km deep in water 2,000 km deep. The depth of the focal center, and the depth of the water are both critical in deciding whether any animals will be seriously injured or not. This particular quake was epicentered over the top of the Macquarie Ridge in water ~500 meters deep. The depth of the whales when they were were exposed is also critical. Encountering seaquake pressure waves when less than 100 meter deep would be more dangerous because the more shallow the whales are, the greater the risk of sinus barotrauma. This is true because the percentage of change in the volume of the air in their cranial air spaces increase with the reduction in ambient water pressure. In addition, whether or not the diving whales encounter the pressure waves in a head-up position or in a head-down position is also critical and will be explained in another article. The earthquake was located at the lower left of the picture below; the stranding beach was in the upper right. The straight distance between the two locations is ~163 nautical miles. 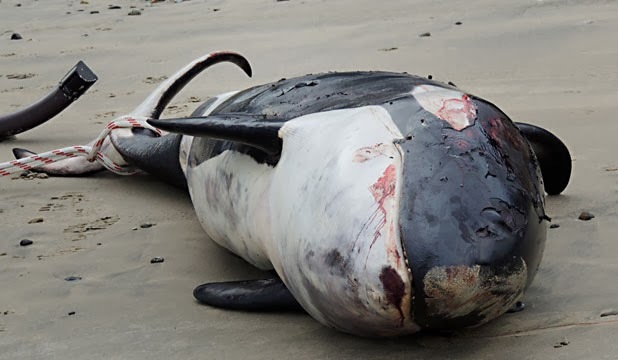 Orca whales have been killed many times by undersea earthquakes epicentered near where they beached. In April 2013, six members of a pod were killed by a series of eight shallow earthquakes off the coast of Iceland a few hundred miles from where they went ashore. And again, on 10 February 2012, the body of L112, also known as Sooke, was found on a beach just north of Long Beach, Washington. About 150 miles from where she was injured. I think this is because orcas are not known as deep divers, and not likely as equipped to deal with rapid and extreme changes in diving pressures as are pilot whales. Sooke was hit by earthquake shocks on 4 February when a magnitude 5.6 earthquake erupted along the Continental drop off, 50 miles west of Vancouver Island. Due to increased resistance (drag forces), whales LOST due to busted sinuses are directed downstream by the flow of the surface currents. Everything floating or swimming on the surface of the sea without a sense of direction, will always float or swim downstream in the path of least drag. It can be no other way. The first thing scientists should check at every stranding is the direction of the flow of the current leading to the beach, the tide flow, and the wind. They would then learn that stranded whales are ALWAYS going with the flow when they go ashore... NEVER against the flow. This would teach them that pods of stranded whales have NO SENSE OF DIRECTION whatsoever. Just like the other orcas mentioned above, the South Island orcas were suffering from a previous earthquake-induced barotraumatic injury that damaged their sinuses (barosinusitis), causing their biosonar to fail. The air held inside their cranial air spaces serves to reflect, funnel, isolate, and direct returning echolocation clicks in a fashion to make their complex biosonar system function. For example, biosonar requires two cochleas working independently (stereographic binaural hearing, not mono-reception). The isolation of their cochlea is accomplished by the air sacs that surround and isolate the two ear bones. If a toothed whales suffers a barotrauma injury to these air spaces, sounds strike both cochlea at about the same time, too fast for biosonar to work. In other words, these orcas were acoustically LOST AT SEA. But how did they end up on a beach inside Te Waewae Bay? As you can see in the chart of the surface currents on the left, there is usually a slight current that slowly washes north at this time of year. 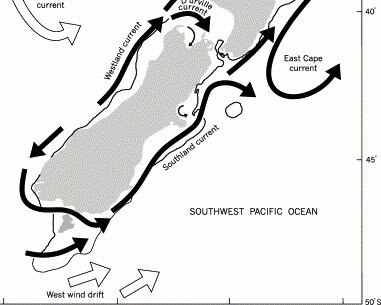 This current flows close to West Cape at the southwest tip of South Island. In my opinion, the flow of the water would have directed the LOST whales slowly north for ~100 miles where they might have spotted Cameron Mountains and moved in closer to shore. With land in sight, they would have been able to navigate somewhat, or at least move along shore and stay out of shallow water by observing the bottom. Killer whales are quite familiar with nearshore waters. This move would have put them in the middle of the counter current that flows east around the southern tip of South Island (see below). They would have enter this current and been carried into Te Waewae Bay during an incoming tide. They hung around the Bay for a few days and were then guided to the inlet near where they run aground during another incoming tide. These whales would use visual clues to avoid beaching but they could not see the fast-approaching bottom after dark because they were had no working biosonar system. The earthquake injury is pressure related barotrauma. It is the most-common injury in scuba divers. It's also common in the swim bladder of fish. Rapid and excessive changes in pressure are a diver's worst nightmare come true. This pod of killer whales ran hard aground west from Blue Cliffs Beach on a long stretch of undeveloped rocky shoreline marking the southern border of Fiordland National Park. Location: 46.150S at 167.500 E.
Here's where my sea captain skills come in handy. I can see the water flowing into the inlet. Look at the very start of the video above (frame 000), you'll see the inlet at the top of the screen. You can also see the waves washing shoreward from the southwest, and the high-water mark by looking at the darker color of the wet rocks compared to the lighter color of the dry rocks. It becomes so easy to spot these things when you've spent a lifetime at sea. This was the same type of inland flow the whales would have experienced during high tide at around midnight on the 10th of Feb. You can see the inlet better on this map. This pod was spotted swimming offshore in Te Waewae Bay during the previous week. They were guided especially close to the inlet (called Rowallan Burn) by the fast inflow of surface water during the rising tide around midnight on February 10. The winds were ~15 knots out of the southwest. The surface currents were flowing shoreward towards the inlet. Big oceanic sharks were following them, tasting their body fluids in the water. They knew the orcas were in trouble and were trailing them, likely trying to separate the youngster from the others. The pod was swimming fast (downstream with the current), trying to escape the trailing sharks. Having no working biosonar, they did not see the shallows and accidentally ran into the rocky shore at about high tide at about 15 minutes after midnight on February 11. They cut themselves up on the rocks, and got stuck when the tide receded from under them. They were found freshly dead and dying by the first visitor to the beach Tuesday morning. The scientists above will have a hard time finding the injury because they have not studied barotrauma in whales, likely because the two major funding sources (US Navy and Oil Industry) have not made money available to study pressure-related injuries in marine mammals. Why should they pay to investigate whether or not their own tools (high-powered sonar, explosives, and seismic airguns) cause sinus injury? And, why should scientists conduct a barotrauma investigation on their own if their major source of money does not want to fund such research? Barotrauma is the one subject no one wants to know anything about other than conservationists and non-profit groups like the Deafwhale Society, who has worked tirelessly for 4 decades trying to understand why whales mass beach themselves with the sole idea that we might discover ways to save them. Many more earthquake-injured whales survived a hundred years ago because there were millions of schools of surface fish they could feed on to sustain themselves while recovering from a diving-related injury. Things are different now. Man, with his large purse seining factory ships, has removed most of the schools of surface fish that earthquake-injured whales depended on for recovery. Undersea earthquakes alone will soon remove all the whales from the sea unless man stops over-fishing. Earthquakes have been killing our marine cousins for millions of years (to learn how and why whale scientists won't tell you the truth about it, click here). 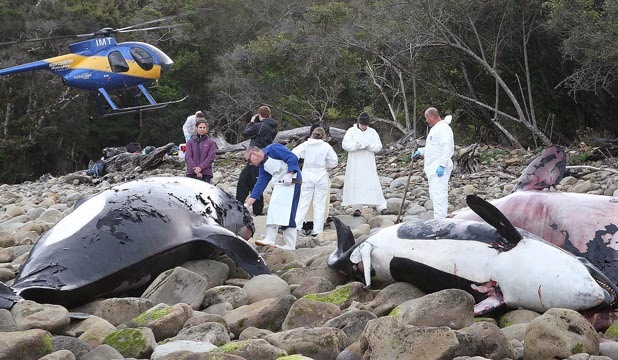 The last time NZ had a killer whale stranding this big was in the '80s at Chatham Island.